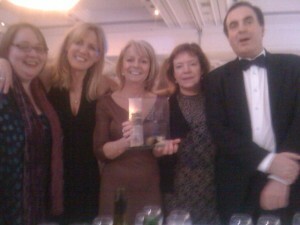 Gill Budgell (centre) of frattempo was Consultant Publisher in the Rising Stars team who were delighted to accept a major category award at the prestigious Education Resources Awards (ERAs). Dockside Reading Scheme won the category for best Special Education Needs (SEN) resource at the gala event after being chosen by an independent panel of education experts. Ray Barker, Director of BESA, commented the winners “should be seen as representing the very best in education” in meeting sector needs, and providing innovative but cost effective resources.